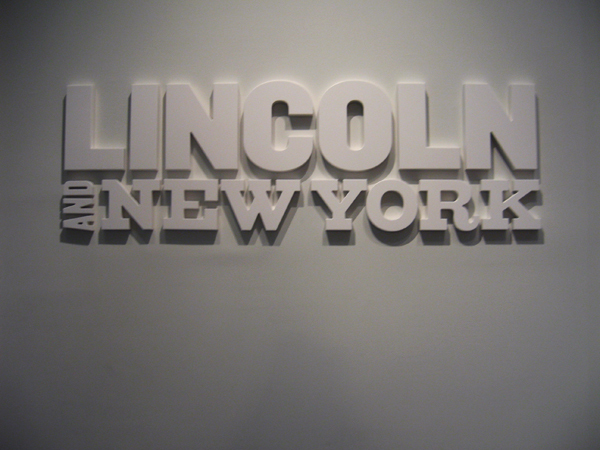 I hadn’t intended to see the Lincoln exhibit at the New-York Historical Society. It so happened that as I was on my way to the American Museum of Natural History, planning to first stop by the Extreme Mammals exhibit before joining the SEGD tour, I became distracted by the banners hanging from every single lamppost along Central Park West. 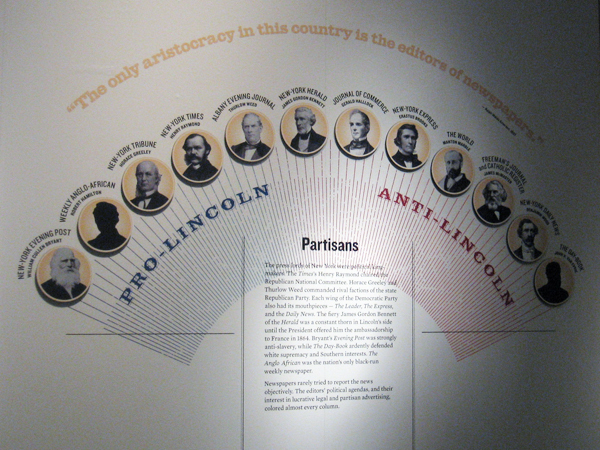 Other than that…I was pleasantly surprised by the contemporary design of the exhibit. The designers, Julia Zaccone and Angela Voulanges, made a smart move by incorporating stylish—trendy, really, but good for them—elements like silhouettes and dingbats. Why do historical topics always have to be presented in the same sepia-tinted way? I liked this fresher approach. Also compelling were the wall structures and layouts. 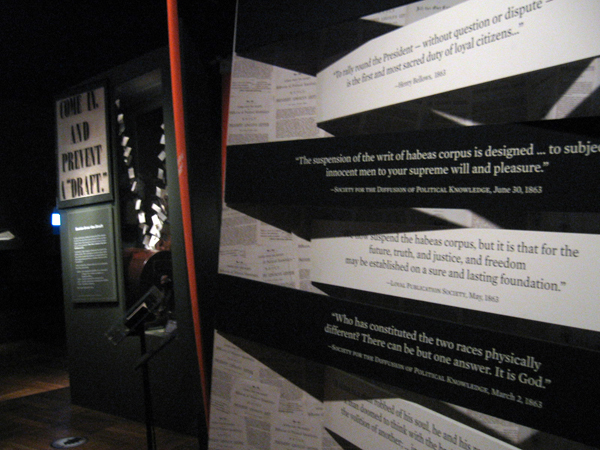 Below are some dramatically angled walls and black and white quotation “banners.” Nice work all around. The exhibit’s up through March 25, so New Yorkers: you have three months’ time to see it for yourself! Hi and thanks for your Lincoln review! The exhibit was created by the N-YHS in-house Exhibitions department with me as (outside) creative consultant and graphic designer. It’s not that often that designers get “professional” feedback and I, personally, appreciate the considered comments. I agree with you re: vinyl– I pushed for at least partial silkscreening (all smaller text panels and the large years on the intros). Unfortunately, it was a matter of cost and timing: vinyl–> fast. The photo I took of the logo doesn’t show its scale, but I thought it was just right—big enough to make an impact while still being comfortable on the wall. Congratulations on a lovely exhibit. It was my first time to N-YHS, and now that I’m in the know I look forward to seeing future exhibits! This looks so beautiful & fresh. The type and use of colors is incredibly dynamic…hope I can check it out soon.